Hard gizzard. Handmade, line thru design, including the eyes. Semi rigid dorsal and thread that will not shatter. Soft tail for greater action. Made from the head of a real gizzard shad a neighbor gave me plus all custom body work using Sculpey clay. Line thru design with internal foam harness. Handmade eyes from the picture of the real shad. Update and hard lesson learned. You cannot clean a mold that's had plastisol poured in it and then pour a platinum silicone bait. One plastisol pour bait, then cleaned with soap and hot water, then multiple acetone cleanings. No help. It's either a plastisol mold or a silicone mold. Can't be both. Just experienced the same thing. I was making a Mold Star 30 mold to pour both plastisol and platinum silicone swimbaits. Mold came out great (original made from resin). Poured a plastisol bait, then after using ample mold release made for platinum silicone, I poured Ecoflex silicone in the same mold. Big mistake. Only the inner cured. The outer touching the mold was a total mess. 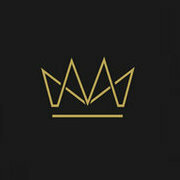 I am experimenting to make sure it is not the release, but I am certain it's due to the plastisol. Platinum silicone is extremely sensitive. Just did not know it was sensitive to plastisol. Tin based like Mold Max 30 is great. Not nearly as sensitive. Thanks for bringing this up. Thanks. Truth be known, it was made from a real shad replica. I can make hard swimbaits, but cannot get the realism like the real thing. It swims best in a soft plastic version. Gizzard shad three section hard swimbait. Original cast made from balsa, sculpey and plenty of patience. Molded with Smooth-On Mold Max 30. This is a resin lure made with Alumilite RC3. I have made multiple versions of this lure focusing on two types; First includes two hooks with and embedded Spro swivels instead screw eyes to reduce leverage during the fight. Second type is a line thru design with one or two hooks. Hooks are held in with screw eyes inserted into embedded rubber tubing that easily pops free during the hook set. All have replaceable super soft plastic tails that bring the bait to life, much better than silicon or rubber. I tried them all. I have settled on the line thru single front #2 Owner treble as the design of choice. 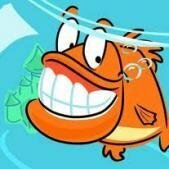 Hookup ratio still high while avoiding the back hook from hooking into the fish's side or eyes. All painted with Wicked and finished with 3 coats of Etex. GIzzard shad. 5/0 Gamakatsu hook embedded in weighted foam harness for swimbait to sit upright at rest. Harness covered with bondcoat to prevent slippage. 10mm Living eyes. Wedge tail with excellent action at slow retrieve. Painted with Lureworks SB including holographic glitter. 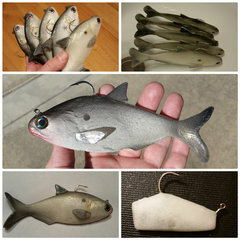 Made from real shad replica and Sculpey molded with Smooth On Mold Max 30. 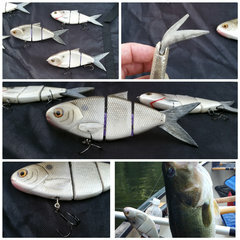 Gizzard shad soft swimbait with wedge tail. Line thru just like a soft swimbait. The line is tied to the screw eye on bottom that can pop out releasing the lure. I attached a pic of another swimbait on mine showing it popped out. Many thanks for all of the positive comments. Thanks a bunch. No foil was used. Just Wicked silver and aluminum, which suprisingly puts off a pretty good flash in the water. Line-thru design on front hook. Made from Alumilite RC3 resin. Dorsal and tail made with semi rigid resin to resist breakage. Etex finish to allow some flex. Thanks guys for the time and feedback. I did not used to clean with dawn. However, after a couple of separations, I figured it needed to be super clean. I have tried cleaning with acetone as well in the past. Lately I've been using Alumilite RC3 just because it's easy to get at Hobby Lobby and made a lure, that after about 5 days of casting, I noticed the blister in a spot. I have never only used one coat of Etex and I have never thought of putting the base coat in the mold. I might have to give these a shot. I need to try the lacquer primer as well. I never use mold release and do thoroughly rinse after washing. Just a pic of the latest creation. I'm sure this one will eventually blister as well if I don't lose it first. Thanks again.